â��Falcon Doors & Windows Pvt. 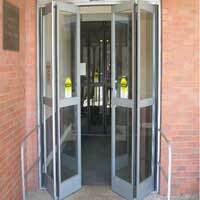 Ltd.â��, is a trusted name when it comes to world class folding Doors manufacturers and suppliers from Maharashtra. We manufacture and supply both center and side folding doors that allow for maximum clearance, even within a confined area.